What's your favorite quote? I am convinced that life is 10% what happens to me and 90% of how I react to it. And so it is with you...we are in charge of our attitudes. What do you like to do in your free time? Spend quality time with my family In a sentence, why do you enjoy working at your company? Having the ability to help change the lives of our students, their families and future generations by getting amazing people to help our students reach that goal career relevant higher education. In a sentence, how does your company have fun on a regular basis? At the University of Phoenix we are more like a family and regularly attend sporting events and volunteer for good causes. In a sentence, how would you describe the employees at your company? 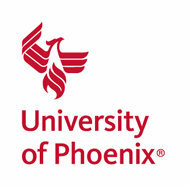 The employees here at the University of Phoenix have the dedication and commitment to helping people change their lives through higher education.